Not to be confused with Adele Live in New York City or Adele Live 2016. Adele Live was the second concert tour by British singer Adele. Visiting Europe and North America, the tour supported her second studio album, 21. Adele was backed by a five-piece band and backing singers, whilst for some songs she was accompanied by piano only. The setlist comprised all songs from 21, except for "He Won't Go", as well as selected songs from 19. The shows garnered positive critical reviews, many of which emphasised the show's understated nature, as well as the singer's vocal performance and accessible persona. Recurring health and vocal problems led to numerous alterations to the tour itinerary. The first European leg of the tour was uninterrupted. However, for the first North American leg, which was originally scheduled from 12 May 2011 in Washington, D.C. to 22 June in Minneapolis, Adele canceled the last nine dates of her tour after she was diagnosed with acute laryngitis. These dates were rescheduled with some additional dates and some larger venues. The tour was sold out quickly across North America and Europe, and received positive reviews. In September 2011, "continuing problems with a serious cold and chest infection" prompted the postponement of seven additional dates on the second leg of the European stop. However, the tour was resumed on 13 September, and new dates for the missed shows were rescheduled. In October 2011, the singer again cancelled the remaining dates of the second leg of her North American tour due to a vocal hemorrhage that caused internal bleeding near her vocal cords. Adele was forced to cancel the remaining dates of her tour to undergo throat surgery for her hemorrhaging. Production designer Rob Sinclair wanted the stage to be sparse so the audience would focus on Adele and her voice. The back wall of the stage featured a "distinctive" wall of 96 cone-shaped lampshades using 60-watt household lightbulbs to illuminate them. Each lamp was individually dimmed and the bulbs of each lamp were dipped in a special rubber solution so they wouldn't break. The rest of the show featured moving lights and lots of white light to focus on Adele at the center of the stage. The moving lights were designed so that they didn't appear to move from the audience's point-of-view and were powered by Jands Vista's next-generation Vista v2 software. The decision to focus on sculpted white light for the stage won "considerable acclaim." The tour was minimalist in every aspect, from stage design to using each venue's own sound system rather than transporting a tour-specific system. The front-of-house engineer for the tour was Dave McDonald. McDonald carried an Allen & Heath iLive-112 with him during the tour and hooked it up to each venue's sound-system with a Cat 5 connector. This allowed the tour to travel light and allowed McDonald to control the mix for each show using each venue's systems. McDonald used plug-ins to replicate the sound of vintage ENT plates for the sound. The tour chose to only use Sennheiser microphones. 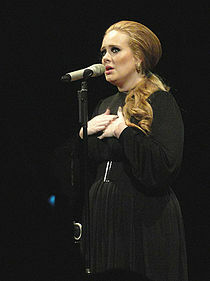 McDonald chose to have Adele use a wireless Sennheiser SKM 2000 system with an SKM 500–965 G3 transmitter. For the back-up singers, McDonald chose hardwired Sennheiser e 935s. The guitarists used Avalon DIs and the piano was a "gag piano", lacquered upright to look traditional but actually housed a Yamaha MO. McDonald's goal for the tour was, "I want the audience to forget who they are for a moment and be able to project themselves solely onto what's occurring onstage. That is, after all, why we go to shows." The tour featured a 12-piece string section that backed Adele up, consisting of eight violins, two violas, and two cellos. During some performances, a 20-ft mirrorball (named "Mirrorball Mike") descended from the ceiling during the encore. A screen lifted up at the beginning of the concert to reveal Adele and occasionally descended behind her with images projected upon it. During "Hometown Glory", an image of St. Paul's Cathedral was projected onto the screen. Adele performing "Someone Like You" during a concert in Seattle, Washington. Starting July 2011, "I Can't Make You Love Me" was added to the setlist. 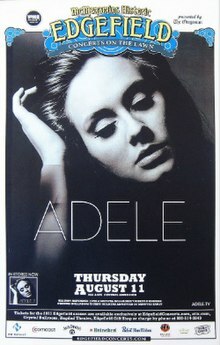 On the second North American leg, "Someone like You" followed "Rolling in the Deep". "As I’m sure most of you know I had to cancel over half of my US tour a couple weeks back. It was a devastating decision to make, but I really had no choice. I had to give my voice 2 weeks rest or risk permanent damage"
— Adele on cancelling part of her North American tour. 26 May 2011 Minneapolis, Minnesota First Avenue This concert has been rescheduled due to 22 June 2011. 29 May 2011 Salt Lake City, Utah The Depot Postponed. The show was rescheduled to 21 August 2011 and moved to the Gallivan Center. 31 May 2011 Vancouver, British Columbia Orpheum Theatre Postponed. The show was rescheduled to 9 August 2011. 1 June 2011 Seattle, Washington Paramount Theatre Postponed. This show was reschedule to 12 August 2011. 3 June 2011 Portland, Oregon McMenamins Crystal Ballroom Postponed. This show was reschedule to 11 August 2011 and moved to McMenamins Edgefield in Troutdale, Oregon. 4 June 2011 Berkeley, California Hearst Greek Theatre Postponed. This show was reschedule to 14 August 2011. 6 June 2011 Los Angeles, California Greek Theatre Postponed. This show was reschedule to 15 August 2011. 8 June 2011 San Diego, California Humphrey's Concerts by the Bay Postponed. This show was reschedule to 18 August 2011 and moved to the Open Air Theatre. 9 June 2011 Los Angeles, California Hollywood Palladium Postponed. This show was reschedule to 16 August 2011. 12 June 2011 Austin, Texas Waller Creek Amphitheatre Postponed. This show was reschedule to 19 October 2011 and moved to the Frank Erwin Center. 15 June 2011 Dallas, Texas House of Blues Postponed. This show was reschedule to 21 October 2011 and moved to the Verizon Theatre at Grand Prairie in Grand Prairie, Texas. 17 June 2011 Atlanta, Georgia The Tabernacle Postponed. This show was reschedule to 16 October 2011 and moved to the Fox Theatre. 18 June 2011 Asheville, North Carolina Wolfe Auditorium Postponed. This show was reschedule to 11 October 2011. 20 June 2011 Nashville, Tennessee Ryman Auditorium Postponed. This show was reschedule to 10 October 2011. 22 June 2011 Minneapolis, Minnesota First Avenue Postponed. This show was reschedule to 24 August 2011 and moved to the Xcel Energy Center in Saint Paul, Minnesota. The concert at The Roundhouse (a part of the iTunes Festival) was streamed live on iTunes. The event was followed with an EP release entitled iTunes Festival: London 2011. The album showcases an abbreviated concert with the songs; "One and Only", "Don't You Remember", "Rumour Has It", "Take It All", "I Can't Make You Love Me" and "Rolling in the Deep". The album is an iTunes exclusive and was made available for download on 14 July 2011. A DVD/Blu-ray/CD entitled Live at the Royal Albert Hall was released on 28 November 2011. It features the entire concert along with behind the scenes footage. Adele: Vocals, guitar on "Daydreamer" and occasionally "My Same"
^ Roberts, Randall (16 August 2011). "Live reivew: Adele, Wanda Jackson at the Greek Theatre". Los Angeles Times. LA Times blog. Retrieved 21 June 2011. ^ a b "Adele's North American Tour Canceled due to Illness". Adele.tv. 3 June 2011. Archived from the original on 7 June 2011. Retrieved 9 June 2011. ^ "Adele cancels North America tour". BBC News Online. 5 June 2011. Retrieved 19 August 2011. ^ "Adele cancels her tour due to vocal hemorrhaging – is it serious?". Los Angeles Times. 5 October 2011. Archived from the original on 6 October 2011. Retrieved 6 October 2011. ^ Nicolini, Jill (31 October 2011). "Adele Cancels Tour, Winehouse New Album". Good Day New York. Archived from the original on 1 November 2011. Retrieved 1 November 2011. ^ Moen, Debi (17 November 2011). "Jands Vista v2 Controls Adele's International Tour". PLSN. Retrieved 5 December 2013. ^ "Adele". Jands Vista. 2011. Retrieved 5 December 2013. ^ Greg DeTogne (22 June 2011). "Enveloping The Audience: The Audio Approach For Adele In Concert". ProSound Web. Retrieved 5 December 2013. ^ Whitney (24 February 2012). "Adele Behind the Scenes". Stephen Arnold Music. Retrieved 5 December 2013. ^ Robert Heller (20 September 2011). "Adele Heads to U.S. With Heartbreak, Jokes, Concert Joy: Review". Bloomberg.com. Retrieved 5 December 2013. ^ Jackson, Josh (26 April 2011). "The Civil Wars to Tour with Adele". Paste. Retrieved 21 June 2011. ^ Bondi, Gabrielle (26 May 2011). "Concert Review: ADELE is phenomenal live!". The Young Folks. Retrieved 24 March 2012. ^ Bondi, Gabrielle (9 August 2011). "Wanda Jackson Joins Adele for North American Tour". Nonesuch Records. Retrieved 24 March 2012. ^ Chilton, Martin (3 March 2011). "Adele picks Amos Lee to be her support act". The Daily Telegraph. Archived from the original on 9 March 2011. Retrieved 9 March 2011. ^ Geoghegan, Kew (16 June 2011). "Michael Kiwanuka: Singing with his soul on his sleeve". BBC. Retrieved 17 August 2011. ^ Herrero, Javier (2 April 2011). "2.500 Aplausos para Adele en su primera visita a Madrid en plena ebullición" [2,500 applaud Adele's first visit to Madrid in full swing]. ABC (in Spanish). Retrieved 4 April 2011. ^ Panzeri, Paolo (31 March 2011). "Concerti, Adele: la recensione dello show di Milano" [Concert, Adele: review of the show in Milan]. Rock Online Italia (in Italian). Archived from the original on 16 May 2012. Retrieved 4 April 2011. ^ Kot, Greg (25 May 2011). "Adele's anti-diva routine a hit". Chicago Tribune. Retrieved 31 May 2011. ^ Frith, Holly (8 July 2011). "Adele Covers The Cure On Her Live London Return". Gigwise. Archived from the original on 19 July 2011. Retrieved 19 July 2011. ^ Jones, Anthony (15 December 2010). "Adele Announces European Tour In Support Of "21"". All Headline News. Archived from the original on 30 November 2011. Retrieved 8 February 2011. ^ "Adele Announces North American Tour in Support of Upcoming Album 21" (Press release). PR Newswire. 7 February 2011. Retrieved 8 February 2011. ^ Glazebrook, Matt (14 June 2011). "Coldplay Latest Act Set for iTunes Festival at Roundhouse". Spinner. Archived from the original on 23 June 2011. Retrieved 23 June 2011. ^ "Adele's North American Tour Rescheduled". The Sacramento Bee (Press release). 23 June 2011. Archived from the original on 23 June 2011. Retrieved 23 June 2011. ^ Copsey, Robert (15 February 2011). "Adele announces further UK tour dates". Digital Spy. Retrieved 21 February 2011. ^ Daw, Robbie (5 July 2011). "Adele Celebrates Gay Pride By Performing At Heaven In London". Idolator. Retrieved 13 July 2011. ^ "Adele to play free London show at iTunes Festival". NME. 28 January 2011. Retrieved 9 March 2011. ^ Riemenschneider, Chris (26 May 2011). "Adele cancels tonight's show". Star Tribune. Retrieved 27 May 2011. ^ a b c d Lipshutz, Jason (31 May 2011). "Billboard Bits: Adele Postpones Tour Dates, 'The Voice' Lands Post-Super Bowl Slot". Billboard. Retrieved 31 May 2011. ^ a b c d e f g h i j k l m "Adele's North American Tour Rescheduled" (Press release). WWBT. 23 June 2011. Archived from the original on 23 June 2011. Retrieved 23 June 2011. ^ a b c d e f g h i j Riemenschneider, Chris (3 June 2011). "Adele cancels rest of U.S. tour, including First Ave date (again)". Star Tribune. Retrieved 4 June 2011. ^ a b "Illness forces Adele to cancel gigs". MSN Music. 4 September 2011. Retrieved 8 September 2011. ^ a b "Fans angry as Adele pulls plug on Cardiff show". South Wales Echo. 8 September 2011. Retrieved 8 September 2011. ^ a b MSN.co.uk (10 September 2011). "Adele forced to cancel more gigs". MSN.co.uk. pa.press.net. Retrieved 11 September 2011. ^ a b c d e f g h i j Moisse, Katie (5 October 2011). "Adele Cancels U.S. Tour Because of Vocal Cord Hemorrhage". ABC News. Archived from the original on 6 October 2011. Retrieved 6 October 2011. ^ "Billboard Boxscore: Current Scores". Billboard. 2 July 2011. Archived from the original on 23 June 2011. Retrieved 23 June 2011. ^ a b "Billboard Boxscore". Billboard. 3 June 2011. Retrieved 27 May 2011. ^ "Billboard Boxscore – Current Scores". Billboard. 26 November 2011. Archived from the original on 16 November 2011. Retrieved 26 November 2011. ^ "Billboard Boxscore – Current Scores". Billboard. 16 July 2011. Archived from the original on 7 July 2011. Retrieved 7 July 2011. ^ "Billboard Boxscore: Current Scores". Billboard. 18 June 2011. Archived from the original on 15 June 2011. Retrieved 15 June 2011. ^ a b "Billboard Boxscore – Current Scores". Billboard. 10 September 2011. Archived from the original on 6 December 2006. Retrieved 3 September 2011. ^ "Billboard Boxscore – Current Scores". Billboard. 17 September 2011. Archived from the original on 8 September 2011. Retrieved 8 September 2011. ^ Salmon, Chris (6 July 2011). "Click to Download: iTunes festival, Red Bull Studios, Gazelle Twin". The Guardian. Retrieved 19 July 2011. ^ Gibson, Donald (16 July 2011). "Music Review: Adele – iTunes Festival: London 2011 [EP]". Seattle Post-Intelligencer. Retrieved 19 July 2011. ^ Kennedy, Gerrick D. (26 October 2011). "Adele to release 'Live at the Royal Albert Hall' album, DVD". Los Angeles Times. Archived from the original on 27 October 2011. Retrieved 27 October 2011. ^ "Tim Vanderkuil official website". Retrieved 3 April 2016. This page was last edited on 22 March 2019, at 13:06 (UTC).